In one sense, John Concannon was ahead of his time. If he was starting off now and doing the same thing, he’d be known as a brand influencer using techniques deployed by the best bloggers. 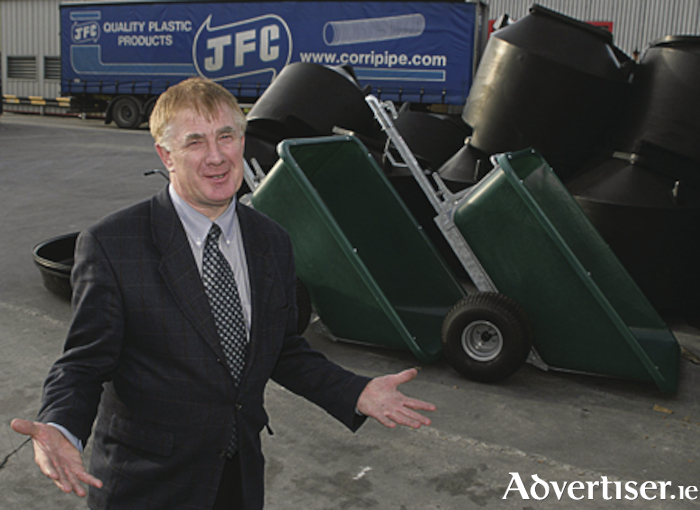 Think of the tens of thousands of guests who appeared on the Late Late Show since its inception in 1961, and in the top twenty clips, up there with the Boyzone segment, the Bishop and the Nightie, is John and his multi-bucket for feeding three calves at a time. While some might think that Gay Byrne was taking the mick with his rare delving into the vagaries of rural Ireland, John managed to turn a scheduled two-minute slot into a 12-minute slot that enthralled the host and the nation. In a dozen minutes, he ensured that the brand kept being mentioned and mentioned until it went on to become the catalyst for a company that in two years time will probably exceed an annual turnover of €100 million across Ireland, the UK, Poland, and the Netherlands. Tomorrow night (Friday ), his company marks its 30th birthday with a major function at the Clayton Hotel in Galway, after a day of celebration and tours at the Tuam plant when owners, friends, and employees will take a trip down memory lane, and get a peek into the exciting future. In those three decades, JFC has gone on to be a market leader by manufacturing and selling plastic products globally for four market sectors namely agriculture/equine, civil, marine, and material handling. The business has reached this leading position in the market by continually developing trend-setting products, which meet and exceed the ever-changing needs of its customers. With sales offices and manufacturing facilities in four countries (Ireland, the UK, the Netherlands, and Poland ) JFC products are sold in more than 30 international markets. I know John for about 25 of those 30 years; to me he hasn’t changed, and still has the same desire, drive, and enthusiasm as he had back then. But now he is at the helm of a major company and that brings its own challenges. I sat down to meet him at his company headquarters in Tuam this week, and find out if he is still driven after three decades. He showed me a hand sized copy of the multi-bucket that they made for the craic recently. Now it works ideally as a holder for a smartphone. John was early out of the education game in his teens, and late in to the entrepreneurship game. Thirty years on, the challenge still excites him. John is still key to the element of innovation in the company and sits in with the engineers and designers when each new product is discussed and planned. He still gets his hands dirty, mucking in when needs be. He was to be seen manning the stand at the recent Ploughing Championship in Screggan and as always, he was one who a lot of people want to talk to. “I still get a buzz out of it. I now know that JFC is so much bigger than just Tuam anymore. We are always actively looking at acquisitions around Europe and that is exciting. I’m a risk taker and I like taking risks but now I have a board to answer to and a good CFO and you have to have that discipline when you’re running a company, and I get a buzz out of what I do. As befits a company that was founded by an inventor and entrepreneur, JFC still receives approaches many times a year from people who have ideas for products, and a small percentage of these manage to get on to the list, but in the main, the ideas for the wide range of JFC products comes from a well-resourced and diverse research end development team working out of their plants in Poland and Ireland. If John’s first TV appearance brought laughter, his next big appearance generated different emotions. Coming from rural Ireland, and having his ear to the ground through his involvement with different clubs, groups, and organisations, he knows the pain and torment that exists through the lack of mental health services for young people. This was brought to light when he went undercover for the hit TV series The Secret Millionaire. Playing a social worker from Mayo named John Brennan, he was given an envelope containing an address and a key to a flat in working class Dublin and told to fend for himself over a few weeks. As soon as he left Heuston Station, he had an encounter that has gone on to save lives here in the west and around the country. Meeting taxi-driver John Quinn who had lost a son to suicide was one of the moments of the show. His connection and kindness to John throughout was exemplary and his shock at discovering that his poor friend was a successful businessman is a memory that will live long. Mr Quinn will be in the west tomorrow for the celebrations. His openness to John was to result in a major donation to Joan Freeman’s Pieta House, but it also proved the inspiration for the development of the Pieta House in Tuam and the encouragement of further Pieta Houses in Donegal and Athlone, and at nine or 10 other locations around the country. TV had given John his first break in life and now, decades later, a made man, he took the opportunity to give back to thousands on another TV programme. The raw emotion of that programme and the knowledge about what it went on to achieve long after its broadcast makes it must-see television. As you read this, there is someone today benefitting from the counselling and advice funded by a drive that John Concannon was able to lead. Because of his ability to cajole money out of large companies, he has been key to providing facilities that are making thousands of people believe that tomorrow will be a better day. But that is John Concannon. People who go to hear him speak always leave inspired. For a man who is generous with his time, unknowingly, he is generous with his wisdom and I have met many people who have been in his audience at mentoring talks, who have benefited from his knowledge and who have always departed his talks with a nugget of advice that they can implement into their business or into their life. John is a man who made himself through hard work and a wisdom garnered through the ups and downs of business. He acknowledges the hard times, the Foot and Mouth crisis, the blow of the recession, and he is wary of the forthcoming Brexit. Listening to him speak makes you bemoan the fact that he hasn’t written a book yet. He says it is something he has been approached about, and something he will only do if it is used to inspire young people to have empathy, and endurance to continue following their dream. And with that, he is up and gone. There is a conference call to be conducted, there are plans to be made for tomorrow, and there’s the little matter of the next decade to be overcome.